In celebration of Women’s History month, this is the fourth post in a series by guest blogger Kim Reynolds (Curator of Manuscripts) focusing on BPL's special collections featuring notable 19th-century American women. Maria Weston Chapman (1806-1885) was a noted abolitionist, editor, writer and activist. She was the oldest of eight children born in Weymouth, Massachusetts to an established New England family. Maria Weston completed her education in London with the support of her uncle Joshua Bates, a banker and an early benefactor of the Boston Public Library. She returned to Boston, where she became the principal of the progressive Ebenezer Bailey's Young Ladies' High School. In 1830, she married abolitionist Henry Grafton Chapman, a strong supporter of William Lloyd Garrison, the editor of the abolitionist newspaper The Liberator. It was through her husband that Maria became deeply involved in the abolitionist movement to end slavery in the United States, and Chapman tirelessly assisted Garrison in editing The Liberator. She also edited the Non-Resistant and National Anti-Slavery Standard and served on the executive and business committees of the Massachusetts, New England and American Anti-Slavery societies. With her sisters Caroline, Deborah and Anne Weston and several other women, Chapman founded the Boston Female Anti-Slavery Society in 1833 and edited Right and Wrong in Boston, the society’s annual reports. She organized the hugely popular anti-slavery fairs that ran from 1835-1858 and raised thousands of dollars for the abolitionist cause. Chapman also edited The Liberty Bell, a gift-book that was sold at the fairs where the works of some of the most prominent American, Irish and British writers of the day appeared. In 1839, she penned Right and Wrong in Massachusetts, a pamphlet in which she criticized other anti-slavery societies for excluding the participation of women. Indeed, it was Chapman’s activism that began to make women more welcome in the abolition movement and created inroads for the cause of women’s rights. Chapman moved her family to Paris in 1848. There, she continued to promote her anti-slavery beliefs and to solicit contributions for the Boston fairs. Returning home to Massachusetts in 1855, she replaced the anti-slavery fair with the Anti-Slavery Subscription Anniversary, an invitation-only event that raised more funds than the outdated fair. She retired from her work in 1863 with the passage of the Emancipation Proclamation outlawing slavery. The correspondence of Maria Weston Chapman includes more than 1,800 letters written by and to Chapman between 1834 and 1885. 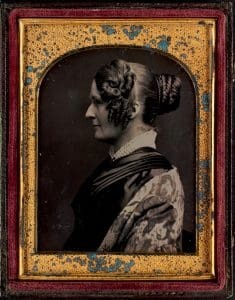 These letters document her work in the abolitionist movement, including her organization of the Boston Female Anti-Slavery Society and the anti-slavery fairs, her editing and writing activities, her relationship with William Lloyd Garrison and other abolitionists, and observations about her family life. The related correspondence of Maria's sisters Anne, Caroline, Deborah, Lucia and Mary Weston has also been digitized. The papers of the Boston Female Anti-Slavery Society contains 168 letters and documents from the organization between 1833 and 1954. They outline the society’s history, governance, and organization of the anti-slavery fairs. Select copies of the organization's annual reports have also been digitized. The Boston Public Library's Anti-Slavery Collection include the correspondence of abolitionists William Lloyd Garrison, Harriet Martineau, Samuel May, Jr., Amos Augustus Phelps, and Frederick Douglass, among others. Learn more about the library's partnership with Zooniverse on a major project to transcribe these letters and consider participating in this important work to make the anti-slavery correspondence even more usable and accessible. Suggestions for further reading on Maria Weston Chapman and the women of the American Abolition movement. The Westons were among the most well-known abolitionists in antebellum Massachusetts, and each of the Weston sisters played an integral role in the family's work. The eldest, Maria Weston Chapman, became one of the antislavery movement's most influential members. In an extensive and original look at the connections among women, domesticity, and progressive political movements, Lee V. Chambers argues that it was the familial cooperation and support between sisters, dubbed "kin-work," that allowed women like the Westons to participate in the political process, marking a major change in women's roles from the domestic to the public sphere. Typical of female abolitionists, the Weston sisters wrote, and collected monies and signatures for petitions but rarely spoke in public to advocate this peculiarly feminist cause. Emancipation was won in Britain in 1833 but in the United States was delayed until 1865. This study uncovers their work, connections and campaigns, and their contribution both to the anti-slavery movement and to the forging of an Anglo-American democratic alliance. A lively exploration of this nineteenth-century reform movement, The Abolitionist Sisterhood includes chapters on the principal female antislavery societies, discussions of black women's political culture in the antebellum North, articles on the strategies and tactics the antislavery women devised, a pictorial essay presenting rare graphics from both sides of abolitionist debates, and a final chapter comparing the experiences of the American and British women who attended the 1840 World Anti-Slavery Convention in London. Explores the origins of the feminist equality-versus-difference debate by examining the Boston Female Anti-Slavery Society, which disbanded in 1840 over this very issue. Hansen concludes that many of the issues that estranged abolitionists in antebellum Boston continue to divide women today.